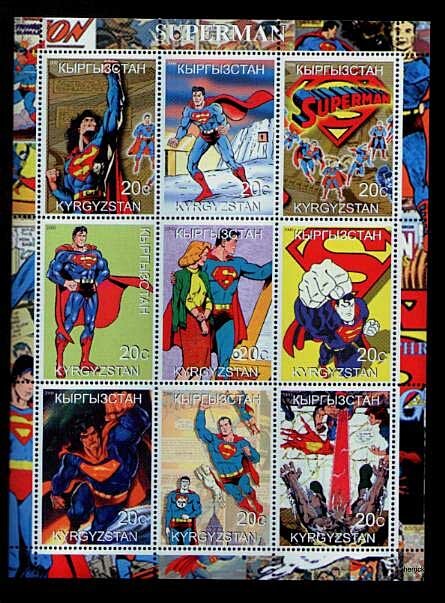 In February of 2001, two distinct sheets of 9 Superman stamps were issued under the names of the neighboring countries of Kirgistan and Tadjikistan. Similar sheets previously released under these names have included Looney Tunes, Pokemon, Ally McBeal, Michael Douglas, Simpsons, and other stamps of popular characters and themes. sheet images courtesy of the Superman Homepage. 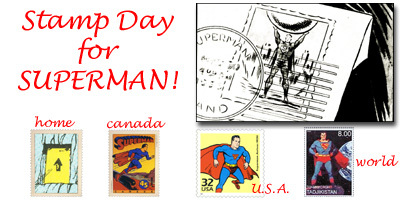 The producers of these stamps downloaded easily obtainable images of fan artwork from assorted Superman websites (a good number of them from the Superman Through the Ages Fan Art Gallery) and turned them into stamps. They did this without the permission of the individual artists or the various Superman website administrators. If you did the artwork on one of these stamps and would like your name listed here and/or a link back to your piece, please contact us. KIRGISTAN - Beautifully illustrated sheetlet of 9 stamps issued by Kirgistan to commemorate the greatest super hero - SUPERMAN! Each stamp features the cartoon hero in a different scene from his adventures. This is sure to be a collectors item. Perfect for mounting and framing. Makes a great addition to any new issue topical collection. 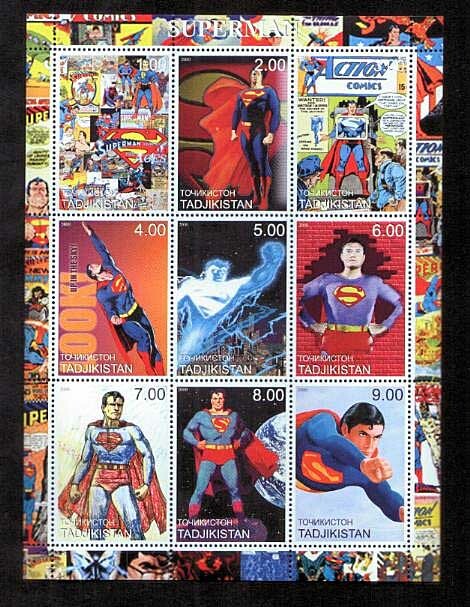 TADJIKISTAN - Beautifully illustrated sheetlet of 9 stamps issued by Tadzhikistan to commemorate the greatest super hero - SUPERMAN! Each stamp features the cartoon hero in a different scene from his adventures. This is sure to be a collectors item. Perfect for mounting and framing. Makes a great addition to any new issue topical collection. NOT VALID POSTAGE: Please note that stamps issued in the names of Terkmenistan, Kirgistan, or Tadjikistan are usually private issues and are not recognized by the Universal Postal Union.